This guide works 100% for Vista & Windows 7 unlike most of the guides out there. I have seen many sites/blogs that have “Install Vista from USB guide” but either with incomplete steps or not working guide. I have also seen some guides that don’t’ use proper commands in this guide. After spending many hours I have come up with this 100% working guide. I just did this method on one of my friends machine and installed the new Windows 7 BETA. The main advantage is that by using USB drive you will be able to install Windows 7/Vista in just 15 minutes. You can also use this bootable USB drive on friend’s computer who doesn’t have a DVD optical drive. The method is very simple and you can use without any hassles. Needless to say that your motherboard should support USB Boot feature to make use of the bootable USB drive. *Windows 7 or Vista installation files. Follow the below steps to create bootable Windows 7/Vista USB drive using which you can install Windows 7/Vista easily. *Type cmd in Start menu search box and hit Ctrl+ Shift+ Enter. *Go to Start menu > All programs > Accessories, right click on Command Prompt and select Run as administrator. 5. Next insert your Windows7/Vista DVD into the optical drive and check the drive letter of the DVD drive. In this guide I will assume that your DVD drive letter is “F” and USB drive letter is “G” (open my computer to know about it). D: CD BOOT and hit enter.Where “F” is your DVD drive letter. 8. Copy your Windows 7/Vista DVD contents to the USB flash drive. 9. Your USB drive is ready to boot and install Windows 7/Vista. Only thing you need to change the boot priority at the BIOS to USB from the HDD or CD ROM drive. 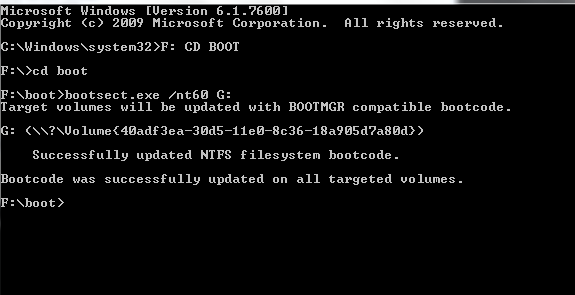 I won’t explain it as it’s just the matter the changing the boot priority or enabling the USB boot option in the BIOS. Note: If you are not able to boot after following this guide means you haven’t set the BIOS priority to USB. If you got any problem in following this guide feel free to ask questions by leaving comment.